It's double the designing fun as we reveal two cards using the same Penny Black stamp, 40-439 Good Neighbors. Zooming in on those Good Neighbors is just what I did for my sweet wish. I selected a small portion of the stamp design as the focal point for the die cut frame. After stamping the design in Tuxedo Black Memento ink, a quick splash of Copic colors were added. A tiny sentiment finishes the design. All stamps by Penny Black: 40-439, 30-358. This image is PERFECT for watercoloring and that's just what I did for my card design. Once the watercolors were dry, I also added a touch of Distress Ink around the edges and to the sky. Easy-peasy and so relaxing! 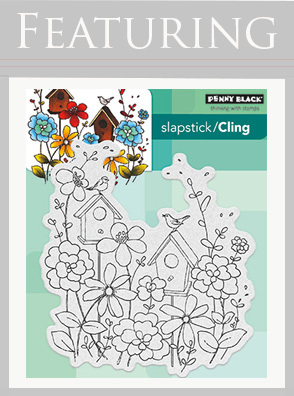 All stamps and dies by Penny Black: 40-439, 30-238, 51-218.